I think this is the first time I’ve posted an outright grumble. Forgive me, but I can’t see the point of cycle lanes that are a free for all. Cars can rarely park on pavements, pedestrians can’t sit in roads, but it appears that cycle lanes are fair game for everyone. They have no legal status. A couple of years ago I was on holiday in Weybridge, Cornwall. Gonvenna Hill descends into the town from the B3314 and has cycle lanes on both sides. These cycle lanes are primarily used by pupils of Wadebridge School, a secondary school towards the top of the hill. During my visit, builders’ trucks and vans were parked all along the cycle lane on the descent side of the road. I took some photographs, attracting abuse and derision from the charming workmen, who took great delight in pointing out that they were legally parked. The fact that every pupil from the school who cycled home along that route was now forced to ride in the main traffic flow didn’t concern them in the least. I checked out the situation online and the builders were right. The vehicles were legally parked. Of course, that didn’t mean that their drivers weren’t being inconsiderate, selfish and ignorant of the risks to children that they were creating. It’s two years on and my commute to work takes me up a 2-mile climb just outside of Bath. In a couple of places, it has traffic calming measures where the road narrows and signs give priority to traffic travelling in one direction or the other. A very inconsiderate driver now uses the end of the cycle lane alongside one of the traffic calming sections to park his large van. This is not a one-off incident. This is his regular parking spot. 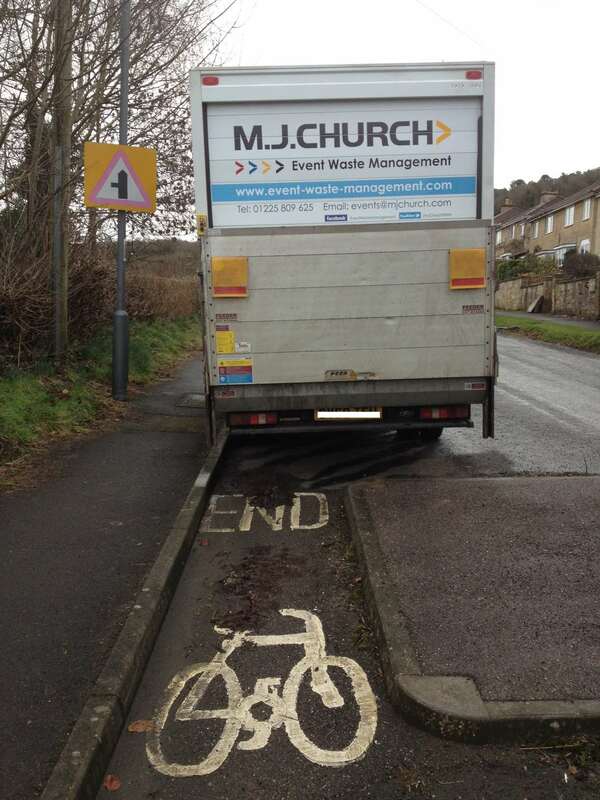 I’ve written a very polite note to M.J. Church, asking the company if it might speak to the van driver to ask him if he’d mind parking a few metres up the hill. I’ll post the response, if I get one. It seems that cycle lines are a free-for-all, with no penalties for those that block or constrict them. They rely on drivers being considerate and, in my experience, that’s the exception, rather than the rule.